"I still consider music to be one of the most human of all arts. It should be created by the feeling person, should be artistically imparted by the aesthetically sensitive person, and should address receptive people." Such statements had been out of fashion for some time. It was vogue to provoke the public instead. 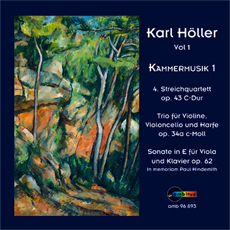 Another characteristic that struck many people as conventional and antiquated was Höller’s persistence in writing tonal music. After Nazi cultural policy ended, Höller experienced the pendulum’s swing to the other extreme, with atonality, serialism, and electronic music promising a departure “to new shores.” Those failing to go along exposed themselves to severe criticism. Formerly suspected of being a modernist, he came to be ridiculed as a reactionary. Just how bitter the same turn must have been for Paul Hindemith is documented by a handwritten note in the piano score of his opera Harmony of the World.